The Quiksilver Premium Workstation ($154) is a great laptop bag for anyone who wants to be able to get a somewhat decent workplace out on he roads. 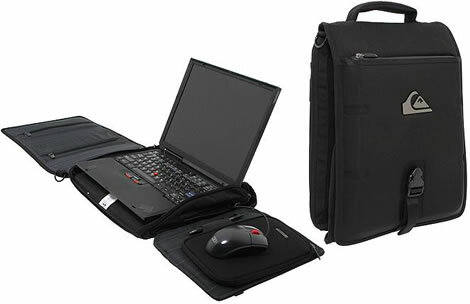 Just open the bag up to access your portable workstation featuring an anti-slip laptop surface, compression molded mouse pad, external media pocket, cool down laptop pocket, and much more. Stretches to accommodate most laptop sizes. The protective design and structure will make sure that your equipment is in safe hands.